In stand mixer with paddle attachment, cream together room temperature butter and sugar on medium-high until light and fluffy. Reduce speed to low and add in eggs, one at a time and mix until just blended. Add in vanilla, 1 tablespoon of orange juice and milk and mix for about 30 seconds on low. Slowly add in dry ingredients and mix until just combined. Remove from mixer then fold in orange zest with spatula. Divide batter evenly among prepared muffin cups. Transfer muffin tin to oven and bake until tops are just dry to the touch, 16 to 20 minutes. Transfer muffin tin to a wire rack. 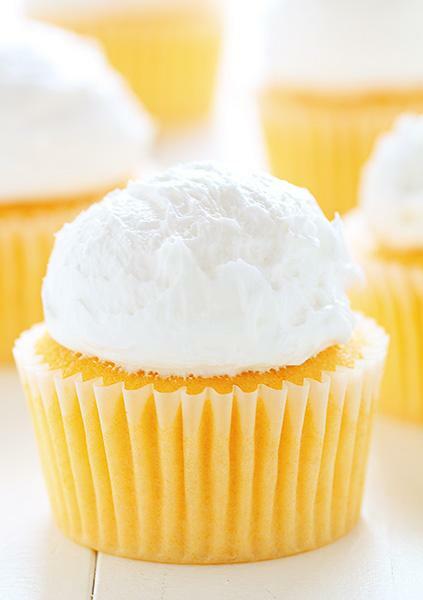 Use pastry brush to brush remaining orange juice over the top of the cupcake. Let cupcakes cool completely and dry before topping with Whipped Vanilla frosting.